In the last posts about ArubaOS 8, I talked a lot about Virtual Mobility Master. This time, I will not include the VMM in my scenario. The reason is simple. Many customers deploy two controllers today. They simply do not need more. So the big question is how to build an environment with ArubaOS 8 and two controllers. The answer is Master Standby. Likely the same design as with ArubaOS 6.x. Just to make it clear, you get the most features, the most benefits and the most outcome from a deployment with VMM. So this is just a plan B if you cannot use the benefits of an implementation with VMM. The Master Standby design requires two controllers, obviously. They run in the standalone mode. Keep this in mind during the setup of the controller. Only the active controller can terminate AP’s in this design. But you can use a variation of the fast failover feature. The two controller run in standalone mode. I use the master redundancy configuration to synchronize the configuration, user data and of course the licenses. If the master fails, you can use the licenses on the standby for 30 days. Enough time to recover. To create minimal downtimes during failover, I also create an HA Group. 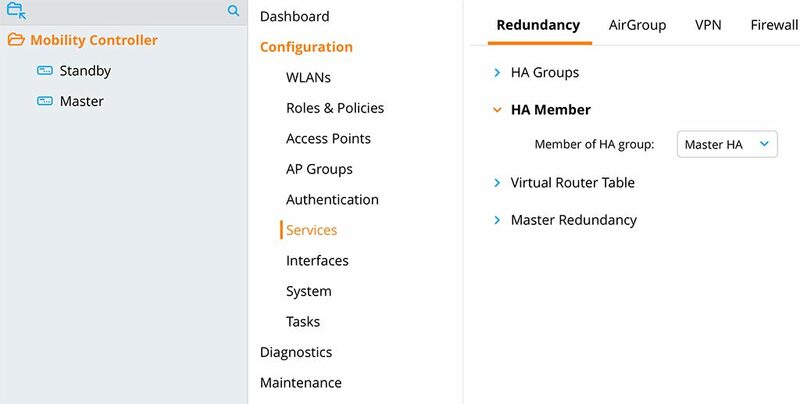 With the HA Group configuration, the AP’s creates a tunnel to each of the controllers. During failover, the AP fails over to the tunnel to the standby controller. This works without a reboot of the AP. Even the radios stay active. Sounds interesting to you? Read further. The first step to build the above design is to create the master redundancy. To start with master redundancy, I assume you have the two controllers running in standalone mode. Preferably fresh vom the factory or after a factory reset. You have configured them with the initial setup wizard to standalone controllers and they have rebooted. Use a meaningful “Description” to avoid confusion later on. I always use the VLAN ID for the “ID”. This assumes I use VLAN 201. This is my controller management VLAN. So both controllers have IP addresses in that VLAN and the controller IP is in this VLAN as well. Enter an “Authentication password” and specify the VRRP “IP address”. I set the “Priority” of the master to 110, to make sure he is always the master. I also use pre-emption to make sure the master is master again after he is back. 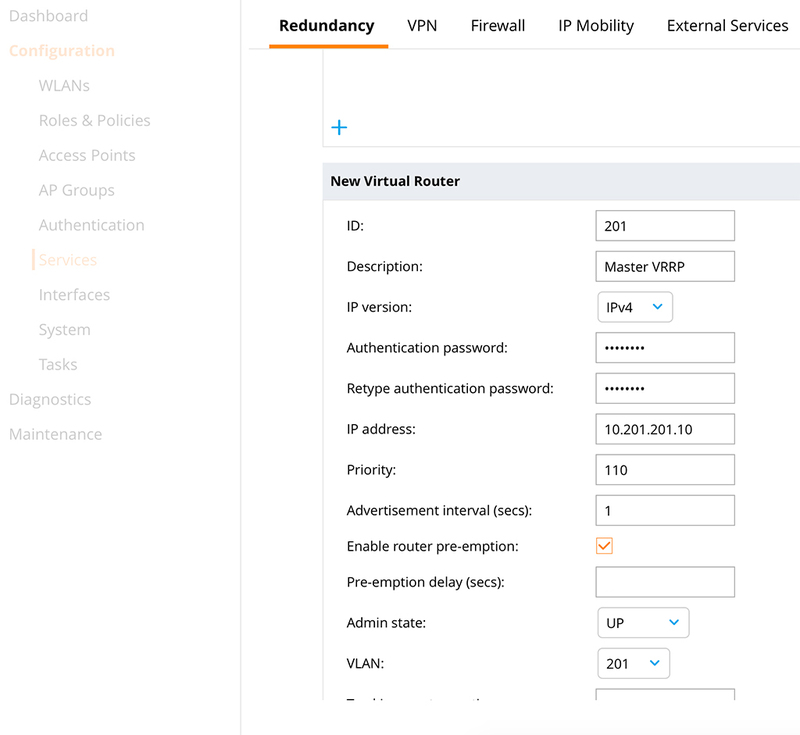 Set the “Admin state” to up and select the VLAN. 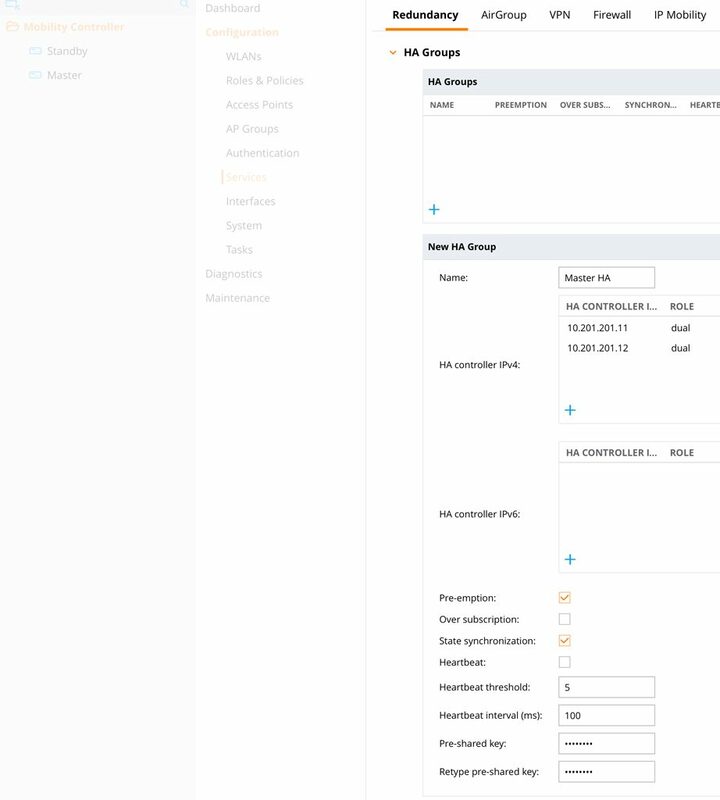 “Submit” the configuration and configure the same, except for the priority, on the standby. For priority use the value of 100, which is the default. I have set the synchronization time to 1 minute. This is to make the waiting time shorter. In production environments, 10 minutes is ok as well. 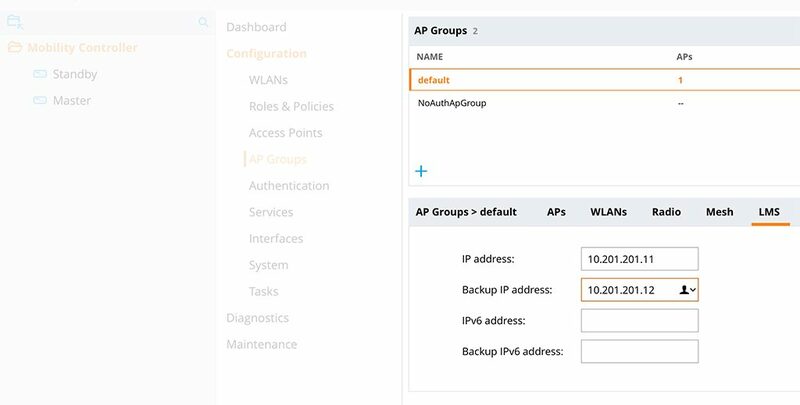 You could now connect an AP. You would use the VRRP address for the connection between AP and controller. 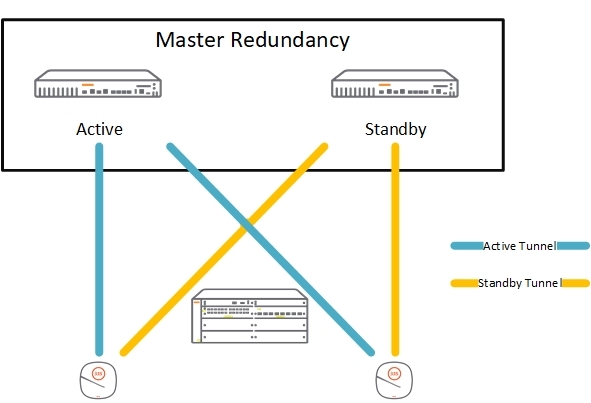 During a failover, the AP would connect to the standby after VRRP changes. But the AP would reboot. To avoid this, we use “HA Groups”. 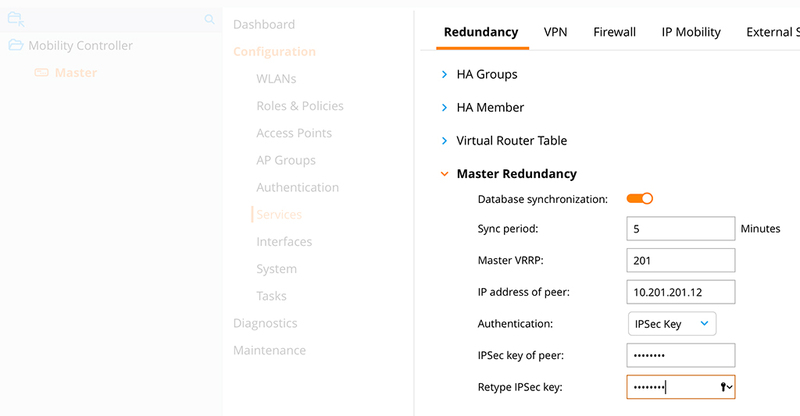 The “HA Group” feature enables fast failover. To do this, the AP creates a tunnel to the two controllers. The first tunnel is the active one. If the controller for tunnel one fails, the AP uses tunnel two to the second controller. This makes the failover time very short and the best, the AP did not reboot during the failover. Add the two controllers to the “HA Group”. You can use the role “dual”. “Active” for the master and “Standby” for the standby works as well. Enable “Pre-emption” and “State synchronization”. Enter a “Pre-shared-key” and “Submit” the changes. Select the “HA Group” from the drop-down list “Member of HA group”. Now, the two controllers form an “HA Group”. Select the “LMS” tab and enter the two IP addresses of the two controllers. The master the first one and the standby is the “Backup IP address”. Save the configuration. You see, that the AP is “Licensed” and “Up” in the master and in addition “Standby” on the standby controller. In case of a failure, the AP uses the standby connection to stay active. Because if the synchronization, all user sessions are available on the standby as well. No need for a complete new authentication. Once the master is back online. All the master functions change back, including the AP termination. The user might see a small interruption, I had only 8 pings failing in the worst case. Normally around 3-5. Do you use this design of master standby or do you prefer a design with virtual mobility master? Tell me and leave a comment below.